Positive thinking is the idea that you can change your life by thinking positively about things. This idea can sound a bit soft and fluffy, which is something of a problem for many people who recognise that just thinking good thoughts won’t change the world and therefore discard the whole idea. However, research shows that positive thinking really does have a scientific basis. You can’t change the world, but you can change how you perceive it and how you react to it. And that can change the way that you feel about yourself and others, which can in turn have a huge effect on your well-being. To understand the effect of positive thinking, it’s helpful to think about negative thinking first. Most negative emotions, such as fear or anger, are designed to help with survival. They cause us to take swift and effective action to save ourselves from whatever is threatening us. This means that they also prevent us from being distracted by other things around us. So far, so good, in survival terms. If there’s a bear standing in front of you, you don’t want to stop to pick flowers. But negative thinking is not so great in more modern settings. If you’ve got a lot to do, and you’re worried that you won’t get it all done, the last thing you need is for your brain to shut down and focus only on how long your ‘To Do’ list has got. Negative thinking is a habit, something you can train your brain to avoid. Constant negative thinking can make you much more likely to be stressed and can lead to more serious problems, like depression. See our pages: Avoiding Stress and What is Depression? for more information. Barbara Fredrickson, a researcher at the University of North Carolina, carried out a classic experiment with five groups of people where she showed each group images designed to provoke a different emotional response. Group 5 saw a series of images designed to make them angry. Each group was then asked to write down what actions they would take in a situation that created similar feelings. Groups 4 and 5 wrote down significantly fewer actions than the other groups. Groups 1 and 2 wrote down the most actions. In other words, feeling positive emotions helps you to identify more possibilities and options in your life. But what is perhaps even more interesting is that these extra possibilities and options seem to translate into action. People who think more positively are more likely to do things to deliver on those options. They build new skills and develop existing ones, so that they genuinely have more options in life. High quality trials for new medicines and therapies compare a treatment group, which receives the new treatment, with a ‘control group’ that does not. But as a general rule, these control groups do not just have ‘no treatment’. Instead, they receive a ‘placebo’, that is, a treatment substitute which looks like the real thing, but has no physical effect. Examples of placebos include sugar pills or flavoured water instead of genuine tablets or medicines. The ‘Placebo Effect’ is a well-documented phenomenon in medicine, in which those who think that they are being given a new and effective treatment are more likely to recover than those who know that their treatment is nothing new. The placebo effect may sound extraordinary, but it has been seen time and time again in clinical trials. The mind is an extremely powerful tool and, if at all possible, healthcare practitioners should help their patients to draw on it. Positive thinking is good. But you should not try to use it to block out everything negative that happens in your life. Sometimes bad stuff happens, and you will feel down about it. It’s no good pretending that you don’t because forced positive thinking can be counterproductive. What you need to avoid is the ‘developing disaster’ scenario (the ‘my life is a total disaster’ tape that plays in your head). The best way to do that is NOT to tell yourself that your life is perfect. Instead, you need to recognise what has gone wrong but set it in context. Tamar Chamsky, a clinical psychologist, calls this ‘Possible Thinking’, and research suggests that it is the best way to recover from difficult events. If you think about positive thinking as ‘being happy’, it is much easier to work out what you should do to develop habits based on it. For example, what do you like doing? And with whom do you like spending time? People who meditate every day show more positive thinking than those who do not. Is that the meditation causing the positive thinking, or just having time to think? It’s hard to tell, but it’s also hard to argue with the science. People who meditate tend to show more mindfulness, or ability to live in the present, which is also associated with positive thinking. A group of undergraduates were asked to write about an intensely positive experience every day for three days. Amazingly, they had better moods and better physical health afterwards, and the effect lasted for quite a long time. This is a pretty easy thing to do: you could, for example, write a blog focusing on positive experiences, or keep a diary. It’s important to make time for yourself to have fun. Sometimes you might need to actually put it into your diary to force yourself to make that time, whether it’s to meet a friend for coffee, or go out for a walk or a bike ride. You can also look at our page on Neuro-Linguistic Programming for more ideas about how to help yourself to think positively. 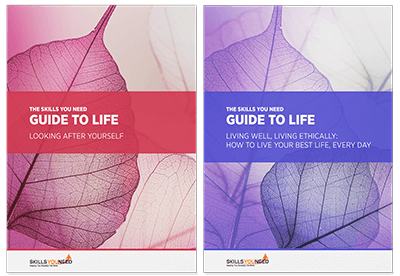 Learn how to look after your body and mind: the fundamental first steps to personal development. Happy people, those with a positive outlook on life, are not just happier, but also seem to achieve much more. While success may lead to happiness, there is very little question that happiness also leads to success. Finding time to be positive about your life, and to do the things that make you feel positive emotions like happiness, is vital to helping you to develop skills and grow as a person.